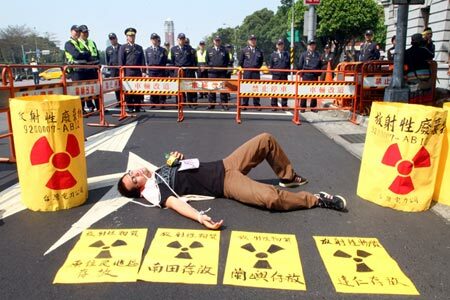 A man puts on a skit about the dangers of nuclear energy at the protest. An estimated 68,000 Taiwanese protesters took to the streets this past weekend in opposition to the construction of what may be Taiwan’s 4th nuclear power plant. The “Nuclear Go Zero” protests took place all across the country, and were followed by an all night vigil in which the participants stayed up until sunrise. I could see and hear the thousands of protestors from my 5th story window. Today marks the second anniversary of the meltdown at the Fukushima Dai-Ichi plant, which took place in Japan after a magnitude 9 earthquake shook the country. The “Nuclear Go Zero” campaign planned the protest in congruence with the anniversary in order to bring awareness of the risks associated with nuclear energy. 1980- Construction starts, but abandoned after the Chernobyl disaster. 2000– Construction suspended again because of opposition. Taiwan, like Japan, lies on the Pacific Ring of Fire, an area bordering the Pacific Ocean that is tectonically active. This spurs the concern that the area is unsafe for nuclear power plants. “If construction of the No. 4 nuclear power plant is stopped, the only feasible option to make up for the lost capacity will be natural gas –fired power plants” said Yang Feng-shuo, the director of energy studies at the Taiwan Institute for Economic Studies, in a recent Bloomberg article. President Ma Ying-jeou has pledged to reduce Taiwan’s carbon emissions to year 2000 levels by 2025 while also phasing out nuclear power. Currently, nuclear power accounts for 20 percent of Taiwan’s energy, and other alternatives such as natural gas and coal have faced opposition. Natural gas is pricey, with it costing $1 more per kilowatt, and coal projects have faced opposition from environmentalists. The President has found himself stuck between a rock and hard place. No one wants the source of energy to be in their backyard, coal is opposed because of environmental costs, and natural gas is opposed because of monetary costs. Leaving him with the weight of answering one of the oldest questions in the book: “what’s the lesser evil?”. Ladies and gentlemen, pick your poison.